People generally associate brain tumors with blurred vision and headaches, but those symptoms did not occur in Peggy Flannigan’s case. Associate chair and associate professor of nursing at Bradley University, Flannigan was diagnosed with a brain tumor in 2002. Contrary to more common signs, her symptoms began with a small amount of sinus pressure and other vague problems. Flannigan with two volunteers in 2011. 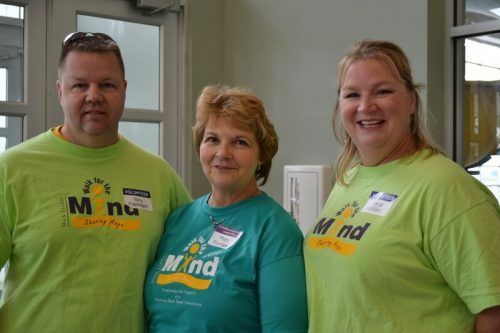 The 14th annual Walk for the Mind is Saturday, Sept. 24, 2016, at the Peoria RiverPlex. In addition to the difficulty finding specific words, her Meningioma brain tumor also affected her handwriting. Meningioma tumors account for 34 percent of all brain tumors and are twice as likely to occur in women than men. Flannigan experienced her symptoms for three to four months before going to see her family doctor. The physician realized that there was an issue right away and ordered an MRI. She figured her doctor thought she had suffered a stroke, but she knew that was not the case. She was scheduled to see a neurosurgeon the next day and went to a hospital to undergo brain surgery a few days later. Flannigan came to know her neurosurgeon well and once asked, “What would have happened to me if I hadn’t gone to see my doctor?” He told her she likely would have gone to sleep one evening and not woken up the next day because of the brain swelling she had experienced. After being diagnosed in 2002, Flannigan received a flyer in the mail with details about Walk for the Mind. Mark Linder, the founder, was diagnosed with a brain tumor in his 20s and wanted a support system for brain tumor survivors as well as those living with tumors. Walk for the Mind was Mark’s way of sharing hope and promoting awareness of brain tumors while raising funds for research. Brain tumors are considered an orphan disease and do not get a lot of funding from major research organizations. An orphan disease is defined by the U.S. Food and Drug Administration as a disease that affects less than 200,000 people nationwide. Other orphan diseases include cystic fibrosis, Lou Gehrig’s disease and Tourette’s syndrome. 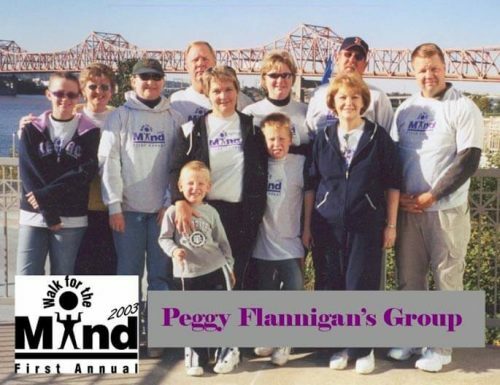 Flannigan’s group at the first annual Walk for the Mind in 2003. Flannigan knew right away that she wanted to support Walk for the Mind and raised $1,000 for brain tumor research in her first walk. She also joined a support group for brain tumor survivors. Before the walk in 2005, Mark had a recurrence of his brain tumor and was very sick; he passed away shortly after the third walk. Mark’s father asked Flannigan to step in as chair, and she agreed. Today, she remains the chair of Walk for the Mind and continues to be listed as a contact for the support group. 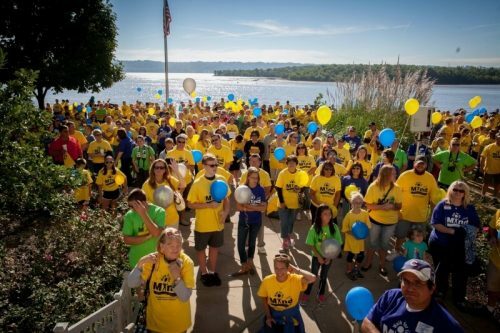 Since 2003, Walk for the Mind has raised more than $500,000 for brain tumor research. For the first nine years, the proceeds were donated to a national organization that funds brain tumor research. The past few years, the funds have been donated to the University of Illinois College of Medicine brain tumor research program. The 14th annual Mark Linder Walk for the Mind is Saturday, Sept. 24, 2016, at the Peoria RiverPlex. Click here to register online, or visit marklinderwalkforthemind.org to donate.